We all want a happy life. A cushy job, a perfect family, financial stability, and a great social life! And in this indefinite pursuit of happiness that is mostly like a mirage, how often do we spare a minute to thank what we already have at this very moment? Gratitude is a powerful human emotion. By conveying and receiving simple ‘thank you’ messages, we can truly derive the pleasure that we seek everywhere else. Gratitude, derived from the Latin word ‘gratia’, means gratefulness or thankfulness. In its simplest form, gratitude refers to a ‘state of thankfulness’ or a ‘state of being grateful’. Does Gratitude Change the Brain? How Does Gratitude Impact Mental Health? In positive psychology, gratitude is the human way of acknowledging the good things of life. Psychologists have defined gratitude as a positive emotional response that we perceive on giving or receiving a benefit from someone (Emmons & McCullough, 2004). “ Gratitude is associated with a personal benefit that was not intentionally sought after, deserved, or earned but rather because of the good intentions of another person” (Emmons & McCullough, 2003). Thanking others, thanking ourselves, Mother Nature, or the Almighty – gratitude in any form can enlighten the mind and make us feel happier. It has a healing effect on us. (Russell and Fosha, 2008). The benefits of gratitude are endless, and in this article, let us try to explore what gratitude it, discuss its scientific base, and understand how we can use gratitude to be happier in life. Gratitude in all forms is associated with happiness. Whether we say ‘thank you’ to someone or receive the same from others, the feeling it brings is that of pure satisfaction and encouragement. Expressions of gratitude help in building and sustaining long term relationships, deal with adversities and bounce back from them with strength and motivation. 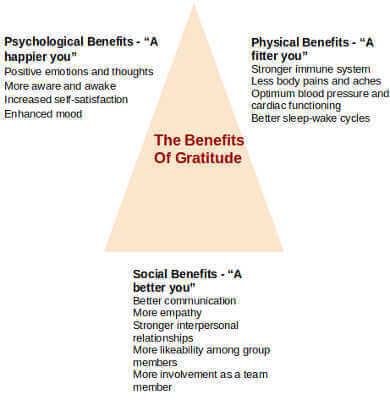 Gratitude improves interpersonal relationships at home and work (Gordon, 2012). 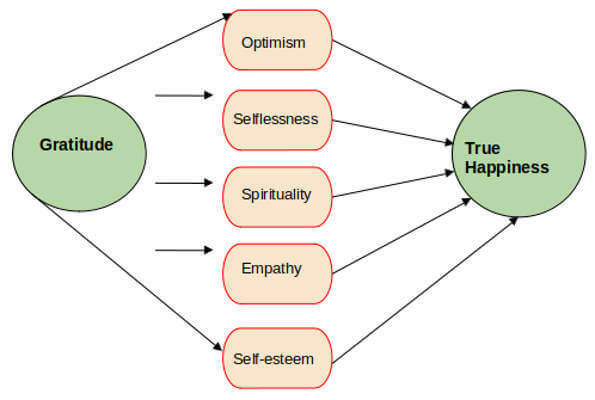 The connection between gratitude and happiness is multi-dimensional. Expressing gratitude not only to others but also to ourselves, induces positive emotions, primarily happiness. By producing feelings of pleasure and contentment, gratitude impacts on our overall health and well-being as well. In a survey on gratitude in adult professionals, British psychologist and wellness expert Robert Holden found that 65 out of 100 people selected happiness over health, although they indicated that both were equally important for a good life. Holden, in his study, suggested that the roots of many psychopathological conditions like depression, anxiety, and stress are unhappiness. Simple practices like maintaining a gratitude journal, complimenting the self, or sending small tokens and thank you notes can make us feel a lot better and enhance our mood immediately. Couple studies have also indicated that partners who expressed their thankfulness to each other often, could sustain their relationships with mutual trust, loyalty, and had long-lasting happy relationships. Gratitude impacts on mental and physical well-being. Positive psychology and mental health researchers in the past few decades have established an overwhelming connection between gratitude and good health. Keeping a gratitude journal causes less stress, improves the quality of sleep, and builds emotional awareness (Seligman, Steen, Park and Peterson, 2005). Gratitude is positively correlated to more vitality, energy, and enthusiasm to work harder. Grateful workers are more efficient, more productive and more responsible. Expressing gratitude in the workplace is a proactive action toward building interpersonal bonds and trigger feelings of closeness and bonding (Algoe, 2012). Employees who practice expressing gratitude at work are more likely to volunteer for more assignments, willing to take an extra step to accomplish their tasks, and happily work as a part of the team. Also, managers and supervisors who feel grateful and remember to convey the same, have a stronger group cohesiveness and better productivity. They recognize good work, gives everyone their due importance in the group and actively communicates with the team members. Gratitude makes a leader compassionate, considerate, empathetic, and loved among others. Gratitude was significant in ancient philosophies and cultures, for example, in the Roman culture, where Cicero mentioned gratitude as the ‘mother’ of all human feelings. As an area of neuropsychological research, however, it was a rare subject of concern until the last two decades (Emmons & McCullough, 2004). Neural mechanisms that are responsible for feelings of gratitude have grabbed attention (Wood et al, 2008). Studies have demonstrated that at the brain level, moral judgments involving feelings of gratefulness are evoked in the right anterior temporal cortex (Zahn et al. 2008). In the same study, it was revealed that the reason why some of us are naturally more grateful than others, is the neurochemical differences at the Central Nervous System. People who express and feel gratitude have a higher volume of grey matter in the right inferior temporal gyrus (Zahn et al, 2014). Emily Fletcher, the founder of Ziva, a well-known meditation training site, mentioned in one of her publications that gratitude as a ‘natural antidepressant’. The effects of gratitude, when practiced daily can be almost the same as medications. It produces a feeling of long-lasting happiness and contentment, the physiological basis of which lies at the neurotransmitter level. When we express gratitude and receive the same, our brain releases dopamine and serotonin, the two crucial neurotransmitters responsible for our emotions, and they make us feel ‘good’. They enhance our mood immediately, making us feel happy from the inside. By consciously practicing gratitude everyday, we can help these neural pathways to strengthen themselves and ultimately create a permanent grateful and positive nature within ourselves. Gratitude has a social aspect to it that argues it to be a socially driven emotion. Social psychologists believe it to be entwined with the perception of what we have done for others and what others have done for us (Emmons and McNamara, 2006). According to them, gratitude is an emotion that directly targets at building and sustaining social bondings (Algoe et al, 2008) and reinforce prosocial responses in the future (McCullough, 2008). Gratitude may be a gesture or a group of kind words that we give or receive from others. But these simple exchanges of thankfulness goes a long way in affecting our overall biological functioning – especially the brain and the nervous system. The effect of gratitude on the brain is long lasting (Moll, Zahn, et al. 2007). Besides enhancing self-love and empathy, gratitude significantly impacts on body functions and psychological conditions like stress, anxiety, and depression. The limbic system is the part of the brain that is responsible for all emotional experiences. It consists of the thalamus, hypothalamus, amygdala, hippocampus, and cingulate gyrus. Studies have shown that hippocampus and amygdala, the two main sites regulating emotions, memory, and bodily functioning, get activated with feelings of gratitude. Consistent evidence has established that what we call ‘emotions’ or ‘feelings’ are neural activations in the neocortical regions of the brain (Moll et al. 2005). A study conducted on individuals seeking mental health guidance revealed that participants of the group who wrote letters of gratitude besides their regular counseling sessions, felt better and recovered sooner. The other group in the study that were asked to journal their negative experiences instead of writing gratitude letters reported feelings of anxiety and depression. Counting Blessings vs Burdens (2003), a study conducted on evaluating the effect of gratitude on physical well-being, indicated that 16% of the patients who kept a gratitude journal reported reduced pain symptoms and were more willing to work out and cooperate with the treatment procedure. A deeper dig into the cause unleashed that by regulating the level of dopamine, gratitude fills us with more vitality, thereby reducing subjective feelings of pain. Studies have shown that receiving and displaying simple acts of kindness activates the hypothalamus, and thereby regulates all bodily mechanisms controlled by the hypothalamus, out of which sleep is a vital one. Hypothalamic regulation triggered by gratitude helps us get deeper and healthier sleep naturally everyday. A brain filled with gratitude and kindness is more likely to sleep better and wake up feeling refreshed and energetic every morning (Zahn et al., 2009). McCraty and colleagues (1998), in one of their studies on gratitude and appreciation, found that participants who felt grateful showed a marked reduction in the level of cortisol, the stress hormone. They had better cardiac functioning and were more resilient to emotional setbacks and negative experiences. Significant studies over the years have established the fact that by practicing gratitude we can handle stress better than others. By merely acknowledging and appreciating the little things in life, we can rewire the brain to deal with the present circumstances with more awareness and broader perception. By reducing the stress hormones and managing the autonomic nervous system functions, gratitude significantly reduces symptoms of depression and anxiety. At the neurochemical level, feelings of gratitude are associated with an increase in the neural modulation of the prefrontal cortex, the brain site responsible for managing negative emotions like guilt, shame, and violence. As a result, people who keep a gratitude journal or use verbal expressions for the same, are more empathetic and positive minded by nature. The Mindfulness Awareness Research Center of UCLA stated that gratitude does change the neural structures in the brain, and make us feel happier and more content. Feeling grateful and appreciating others when they do something good for us triggers the ‘good’ hormones and regulates effective functioning of the immune system. Scientists have suggested that by activating the reward center of the brain, gratitude exchange alters the way we see the world and ourselves. Dr. Alex Korb, in his book Upward Spiral mentioned that gratitude forces us to focus on the positive sides of life. When we give and receive ‘thank you’ notes, our brain is automatically redirected to pay attention to what we have, producing intrinsic motivation and a strong awareness of the present. Also, at the neurochemical level, gratitude acts as a catalyst for neurotransmitters like serotonin, dopamine, and norepinephrine – the ones that manage our emotions, anxiety, and immediate stress responses. Grateful people can derive more happiness and pleasure in daily life. As mentioned by G.K. Chesterton in his famous agricultural metaphor, the pursuit of true happiness is much the same as cultivation. We won’t get the desired result unless we nourish and nurture the seeds properly (Chesterton, 1986). The effects of practicing gratitude are not immediate, and they don’t appear magically. But once started, gratitude continues to impact our physical and psychological well-being for years. We know how to experience and express gratitude. All we need sometimes is a little push or a reminder of how powerful and vital gratitude exercises are. Dr. Amit Kumar revealed an interesting fact in his recent research on gratitude exercises. In the study, participants were asked to leave notes to people who meant a lot in their lives – for example, teachers, spouse, or friends. And these notes were not small papers saying ‘thank you’. They had to be detailed and more in-depth. Surprisingly, participants could finish writing lengthy gratitude notes in less than five minutes, and reported feelings of contentment after doing so. 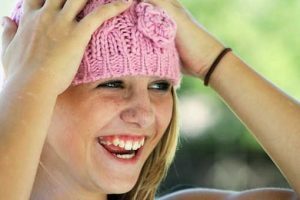 A study on gratitude and its connection to happiness (1993) revealed that voluntary expressions of joy – like a smile or a few kind words, influence the brain to respond and reflect positive emotions only. Unhappy people lean more on their weakness and struggle with their self-identity. We must stop doubting ourselves and start celebrating our achievements. Wondering how? Here are some simple hacks that might help you. Stand in front of your mirror and speak out five good things to yourself. It can be about your past achievements or your present efforts, your talents and your virtues. Just say the words aloud. Compliment yourself with words like beautiful, loyal, disciplined, kind, loving, etc., and notice if that makes you feel better. Repeat this as often as you want to and record your experience. You might have heard about this before. A gratitude journal is your personal space to pen down all the little and big things in life that you are thankful for. Your gratitude journal can accommodate in your ‘dear diary’, your daily planner, or your online notepad. 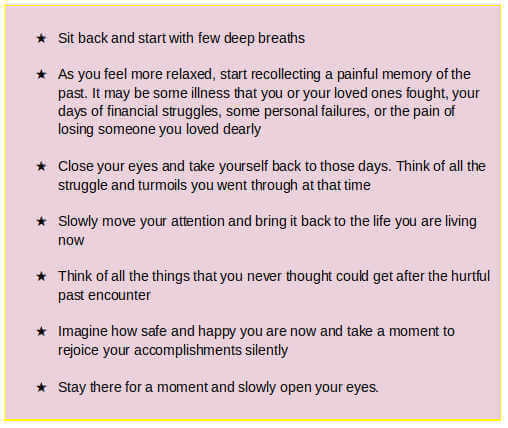 As you sit to express gratitude, you will consciously choose to focus on the good memories and might even recollect some long lost happy moments. We all have someone, whose unconditional support and help meant a lot to us. We feel as if we ‘owe’ our happiness and success to them. If you have such a person, he/she might be your friend, family, or a professional associate, meet them once or twice a month. Initiate the plan, go and express your thankfulness one more time – let the person feel important. Exchange some good memories and offer your support. In most cases, gratitude visits bring a feeling of sanctity and positivity instantly. If you feel happy, don’t shy away from it. Remind yourself that you have worked hard enough to achieve this and you truly deserve it. Be it a huge achievement or a small success, acknowledge your joy and be thankful for the moment. Accepting happiness makes us stronger and more grateful for what we have. We learn to praise our efforts and prepare ourselves better for facing difficulties in the future. Find a gratitude buddy for your daily practice – it can be your spouse, your kid, or your friend at work. Set aside some minutes everyday where you two (or more if you have more buddies) sit together and discuss the things you are thankful for. Ask questions to each other and open up informally. Sharing thoughts of gratefulness with someone is a great way to sustain motivation strengthen your emotional skills. Anxiety is our body’s inbuilt wake-up call that alerts us against danger. When fear sets in, our body releases hormones that create the fight or flight responses, and we react likewise. The brain doesn’t get much time to analyze the right or wrong when the adrenaline rush begins. The worst upshot of anxiety is that it makes us feel insecure, and we start questioning our inner strengths. Eventually, coping mechanisms start failing. In the book ‘Grateful Brain,’ author Alex Korb said that our brain is conditioned to function in a repeated way. For example, a person who worries too much about the adverse outcomes will subconsciously re-wire his brain to process negative information only. Korb has mentioned that our mind cannot focus on positive and negative information at the same time. 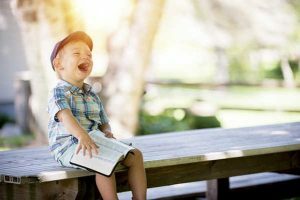 By consciously practicing gratitude, we can train the brain to attend selectively to positive emotions and thoughts, thus reducing anxiety and feelings of apprehension. These findings got stronger validation after a recent study conducted on the relationship between gratitude and death anxiety (Cheng, 2011). The experiment was conducted on 83 Chinese adults, aged above 60 years, who were divided into three groups. One of the three groups were asked to write gratitude notes and words of positivity, another was asked to write about their worries, and the third group was given a neutral task. After task completion, the groups were exposed to stimuli arousing death anxiety, the inevitable fear that we all suffer from. Results showed that participants of the first group who wrote gratitude notes showed fewer symptoms of death anxiety than the other two groups. Re-examination of the results showed that with a grateful attitude in life, we gain acceptance and become fearless of the future. At a neurobiological level, gratitude regulates the sympathetic nervous system that activates our anxiety responses, and at the psychological level, it conditions the brain to filter the negative ruminations and focus on the positive thoughts. Because of its implications in anxiety reduction, gratitude practices like journaling and group discussions are now a significant part of mental health interventions and life coaching regimes. Gratitude practices are especially effective for treating phobias like death anxiety, PTSD, social phobia, and nihilism. “Gratitude makes sense of your past, brings peace for today, and creates a vision for tomorrow” – Melody B. Difficult as it may sound, but grieving with gratitude can bring in a ray of hope in the darkest times in life. Finding a reason to be thankful in days of despair may seem impossible. In her article on gratitude and grief, Kelly Buckley mentioned how she found the meaning of her pain and her life after losing her 23-year old son. While it is true that practicing gratitude makes us resilient to negative emotions and distress, it cannot be denied that mundane misfortunes are inevitable and are bound to affect our well-being. Crying doesn’t make us weak. Instead, it is an act of acceptance and awareness of our emotions. We cry because we know how we are feeling and why we are feeling so. It gives a vent to the pain and helps us to step up and change our lives. Grieving with gratitude lets us appreciate the things that we still have. For example, for a person who just got fired from his job, thanking his family and friends, who stand by his side during the crisis, can help in reducing the pain. By consciously acknowledging their love and support, he can feel grateful and regain the motivation to look for other employment opportunities. Do not hesitate to seek professional help when all your coping mechanisms fail. Studies have shown that people who practice gratitude are more willing to participate in counseling and therapy for managing their depression, and the prognosis is much brighter in such instances. Keep a glass jar or a transparent box and some small pieces of paper beside it. Take up one paper everyday and write about one thing that you are grateful for today. It may be your family, good health, loving friends, your home, or yourself for enduring so much – anything that made you feel blessed that day. As the jar gets filled up, you will naturally feel more gifted and hopeful. The grief may still be there, but you will gain the strength to look beyond it. Gratitude fosters adaptive coping mechanisms. By managing positive emotions like satisfaction, happiness, and pleasure, gratitude enhances our emotional resilience and builds our inner strength to combat stress (Steinhardt, 2016). Psychologists Shai Davidai and Thomas Gilovich, in one of their papers, called the ‘Headwinds/Tailwinds Asymmetry: An Availability Bias in Assessments of Barriers and Blessings’ mentioned that we tend to focus more on the obstacles and difficulties of life because they demand some action. We have to fight and overcome them to get back the normal flow of life. On the flip-side, we forget to attend to the better things in life because they are ‘already there’ and we don’t have to do anything to make them stay with us. Practicing gratitude, according to Gilovich, is the best way to remind ourselves of the things that give us the courage to move on in life. A cross-sectional study published in the International Journal of Social Psychiatry found a strong positive correlation between gratitude, resilience, and feelings of happiness. The study was conducted on a large sample of the adult population, and statistical treatment showed that participants who felt more grateful and practiced gratitude journaling, were found happier and emotionally stronger than others (McCanlies, 2018). An extension of the study on depressive patients showed that those who practiced gratitude exercises recovered soon and felt more motivated to bounce back from their distress. Empathy – The strength to feel others and look into the matter from their point of view. Sustain relationships and appreciate people who are there for us. As a result, we feel more loved, cared for, and more hopeful. Starting any gratitude practice with a brisk meditation and breath control session is a good idea. Deep breathing and constant focus allow the mind to settle down and gather itself. You feel more relaxed and more connected to yourself, and now is a good time to start your practice. Much like the gratitude journal, the gratitude list will help you come face-to-face with your blessings. Take a pen and paper (or your mobile notepad) and make a list of all those people who offered their support when you needed it the most. While you are writing, try to revert to the days and feel the thankfulness in your heart again. Once the list is made, look at it for 2 minutes and go back to work. Once your gratitude list is completed, start writing small thank you note to each of the people you mentioned in the list before. The notes can be as short as you want, but make sure you are pouring your feelings into them. Send the messages to the people concerned – either as handwritten notes, or SMS, or emails. Just make sure your message reaches them and do not expect responses. Notice how this makes you feel more grateful and appreciative of the present. The time travel that we do with this meditation instantly exposes us to our fortitude – we start feeling more confident of ourselves and gain the strength to fight stress in the same way we did before. Stress is our body’s natural response to change – be that good or bad. Positive stress or eustress brings us joy and is usually the least of our concerns. Unforeseen setbacks trigger negative stress or distress. We consider it as toxic and want to get rid of it. Robert Emmons, a well-known mental health specialist, conducted several studies on stress and health which indicated that gratitude effectively releases stress hormones and increase positive emotions like happiness. Commitment to daily gratitude practice reduces an array of negative emotions and is a natural stress detox for the mind and body. Studies have indicated that people who feel more grateful to Him, are healthier and stress resilient in life (Krause, 2006). An experiment conducted on three groups of individuals, each team representing a particular age-group, revealed that older men and women felt more grateful to God for their lives, and scored a high stress-tolerance index than others. Gratitude is not a quick heal or an immediate relief for stress. Practicing gratitude doesn’t mean that we will be ever happy and delighted. Gratitude asks us to accept that we are sad and focus on how to reduce it. We don’t expect miracles when we write a gratitude journal; we just get a closer view of the right things that still exist in life. The benefits of gratitude journaling are multifarious. By being more grateful in the inside and expressing it on the outside, we gain the power to combat and cope with the stress. Dr. John Medina, in his bestseller project ‘Brain Rules’ mentioned how gratitude could be an eyeopener in low times. He indicated that by looking around and acknowledging the support that we have right now, we can successfully shift focus from our burdens to the blessings we have. Depression has a psychological and a neurochemical base – both of which can be addressed by gratitude. By displacing our attention from problems to solutions, gratitude practices hit the serotonin, dopamine, and oxytocin – neurotransmitters that make us feel good. 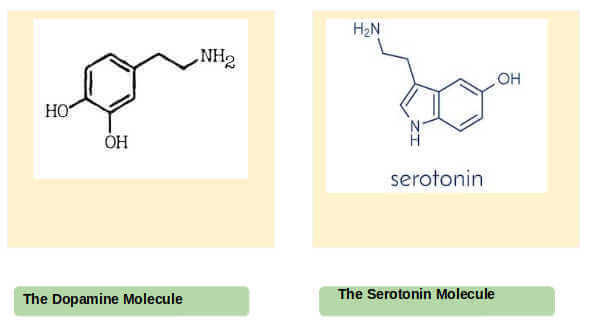 With the surge of these chemicals in the brain, the apathy gets curbed away, and we revive the motivation that depression had sucked away. Gratitude and appreciation is entwined with numerous benefits including enhanced mood and self-esteem (Killen & Macaskill, 2015). Gratitude as an intervention for treating depression is convenient, less time-consuming, less expensive, and useful for the long-term (Mills et al., 2015). Sansone and Sansone (2010), has suggested three gratitude practices that work best with depression and grief. Set aside some time (for example early in the morning or right before bedtime) and journal your gratitude the same time everyday. Go through the previous pages and recollect the good things that happened to you in the past. When filling the journal, try to be as detailed as you can. Record every little thing associated with the person or the incident you are offering your gratitude to. Make your journal attractive. Use colorful pens, stickers, or craft papers to give the gratitude journal an exciting look. Make the journaling more of an experience rather than a daily practice. Self-assessments like GQ-6 or the Gratitude Assessment can be a good way of evaluating how grateful we feel from the inside. 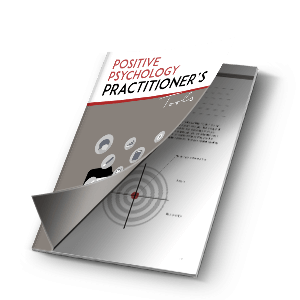 Besides gaining insight on our level of gratitude, gratitude assessments increase awareness and present to us the array of possibilities to deal with our stress and negativities. You can also take the Gratitude Quiz developed by Mitchel Adler and Nancy Fagley, which gives an accurate estimate of what we are grateful for in life and how we can cultivate the mind to extract gratitude from the kindness we receive. Gratitude meditation is a simple grounded technique to resonate our thoughts and feelings on all the people, situations, and things that we are truly grateful for. Through gratitude meditation, we choose to focus on ourselves (our achievements, our talents, our feelings at the moment) and on the world (our family, friends, and everyone else who unconditionally love and support us). It enhances perspective, clarifies vision, and frees us from the burden of stress and burnout almost immediately. Stress does not have to control our lives when we feel and express gratitude regularly. There is no part of well-being that is untouched by gratitude, be that physical, mental, or social. Practicing gratitude is gaining a life-view of thankfulness. By appreciating ourselves, our dear ones, Nature, and the Almighty, we experience the purest form if all positive emotions. It helps us to realize that nothing is obvious and nothing is to be taken for granted – for it is the little things in life where our real joy lies. Gratitude improves the sleep-wake cycle and enhances mood. It helps people with insomnia, substance abuse, and eating disorders. Practicing gratitude is synonymous to expressing our feelings for others and ourselves. By simple words of love and praise, we not only make others feel good, but we also feel a lot better of ourselves and our lives. Gratitude is about feeling the right way, about the right things, and at the right time. It is inseparably linked with self-discipline and motivation. It may not give us instant relief from pain and stress, but it brings the feeling of control back to us. “Gratitude drives happiness. Happiness boosts productivity. Productivity reveals mastery. And mastery inspires the world”. Emmons, R. A., & McCullough, M. E. (2004). The Psychology of Gratitude (Series in Affective Science). New York: Oxford University Press. Ekman, P., & Davidson, R. J. (1993). Voluntary smiling changes regional brain activity. Psychological Science, 4(5), 342-345. Lau, R. W., & Cheng, S. T. (2011). Gratitude lessens death anxiety. European Journal of Ageing, 8(3), 169. Such a useful article. Thank you so much!